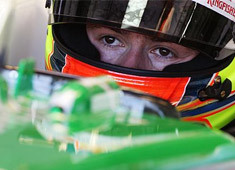 The Force India F1 Team made a solid start to the 2011 season today with Adrian driving home the VJM04 to secure 11th place and Paul finishing his first ever Grand Prix in 12th position, both just outside the points. In the glorious Melbourne sunshine, Adrian and Paul made a good start to the race, running in P10 and P12 respectively by the end of lap one. Paul was the first to pit for a set of new option tyres on lap 14 while Adrian's first stop came on lap 16. For the team's second pit stops Adrian came in for prime tyres on lap 37 and Paul for new primes on lap 36. The pair then ran consistently in 11th and 12th, maintaining their positions until the chequered flag at the end of the 2011 Australian Grand Prix. Adrian Sutil (car 14): "Generally it was not a bad race. Coming from 16th was not easy; the start itself was good and as usual there were a lot of cars at the first corner, but I made up several places by the end of lap one. We had good performance on the track and in the end it was a good race for the first one of the season. It is a shame that we were just outside the top ten, but we hope to have improved our pace and be in the points in Malaysia." Paul Di Resta (car 15): "We had quite a good start and fight with Kobayashi, but that allowed one of the Toro Rosso's by and from there we lost a bit of momentum. Our pace was just a little bit behind today, but hopefully by Malaysia we will be able to understand why and, when the upgrades come, perform at bit better. Adrian and I were on different strategies and we had to fuel conserve toward the end that's why the gap opened up. I am going into Malaysia to try to do a better job than I did here today, but overall I am relatively happy." Otmar Szafnauer, chief operating officer: "It was good to see both Force India cars run a consistent race today. It is, of course, disappointing to finish just outside the points, but we have to look at the positives and what we have learned this weekend. Paul drove an impressive first race, looking after his tyres and showing that he has made a comfortable transition into F1. Adrian made up five places from the start and gave a good performance today. Moreover, the team's results confirm that our reliability is there, what we need to work on now is our race pace to be genuinely in the hunt for points. "